I came across this little ‘jingle ‘ over two years ago and thought it was a great idea! I started work on it straight away…but I hadn’t held a knitting needle in decades so it took me a while to complete them. 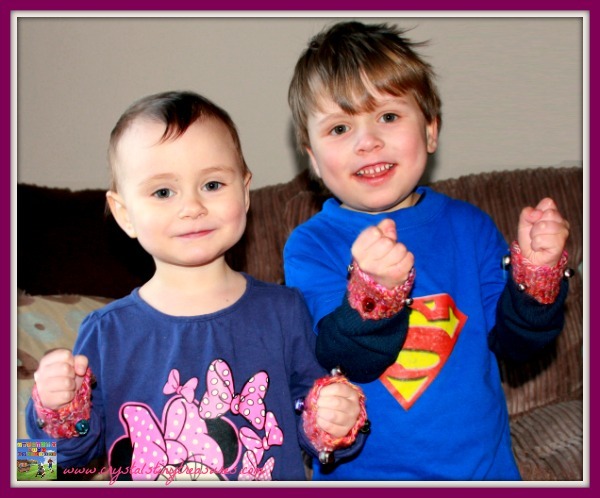 Actually, once you get going it isn’t difficult at all to make these Jingle Bell Wrist Bands! I don’t have any photos of the work in progress, as that was long before I thought of doing such things. 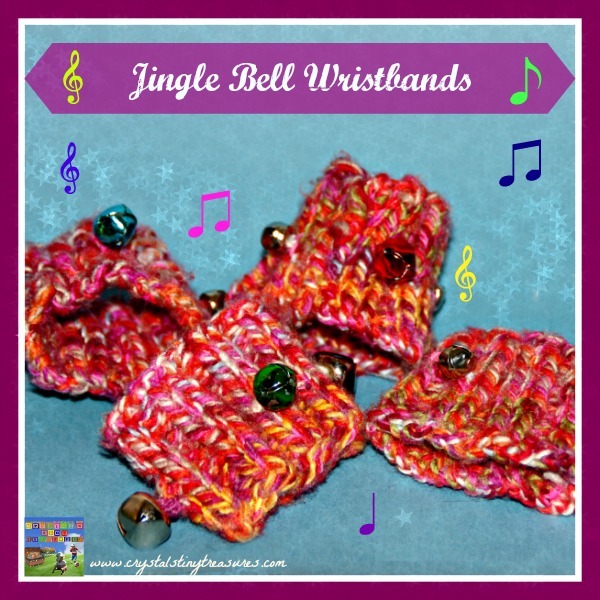 How can I make Jingle Bell Wrist Bands? To make the wrist/ankle band you do a ribbed pattern of knit 2, pearl 2, using a minimum of 22 stitches and increase in increments of 4 if needed. I don’t recall what the number was for my children. But as every child is a different size, you can measure what you think will work for your child/grandchild. This width will have to fit around either your baby/child’s ankle or wrist. When I made these bell wrist bands they fit around Kallista’s ankles and Tristan’s wrists. Now that they’ve grown they can still be used, but only on their wrists. Continue to knit 2 pearl 2 until you have a strip that you think will be wide enough for the cuff. Cast off. Then loop your bands into a circle and sew the ends together with a little yarn or embroidery floss. Next you sew the jingle bells onto the cuffs. You may find it easier to sew the bells on first before sewing the cuffs together. 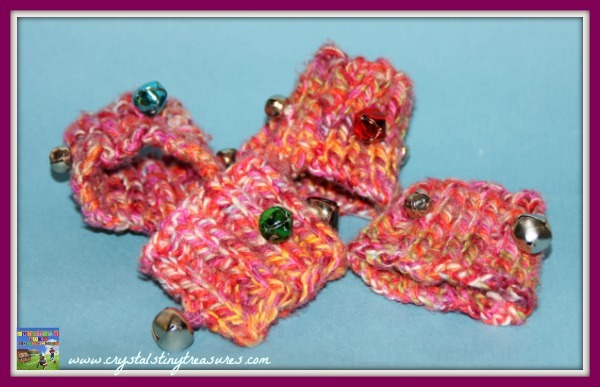 Be sure to use bells that have the little extra bit on them that makes them easier to sew on. Cut your loose thread ends and let your young one have fun. Babies will love having these on their ankles and/or wrists to learn about gross motor control. As the babies grow you can practice learning colors with them, depending on the color of the yard you’ve used, or the color of the bells. My children love the feel of the ribbing, and the coolness of the bells. 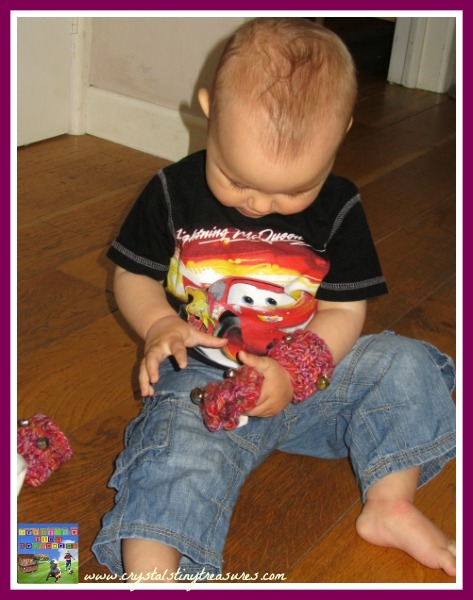 As wee ones grow older these bell wrist bands are still lots of fun for play and music times. At Christmas the kids used them as an accompaniment when we sang ‘Jingle Bells’ and other Christmas tunes. Now they are used with many other songs, such as with Daria’s Little Songs of the Andes and Megson’s When I Was A Lad. But often the kids will get them out of the toy box and wander around the house just jingling the bells to their own beats while singing away. I just love to hear them making music, entertaining themselves, and having FUN! If you’re proficient at knitting (or like me and very much a beginner) and have a little spare yarn hanging about I’m sure you could make a set of these in no time for that special someone! They make great gifts! As you can see, I made these long ago, but I shared them on a weekly Google+ craft hangout hosted by Red Ted Art. There were many other great musical instruments created as well so be sure to go check them out! Blue Bear Wood had some Bottle Blowing Music, a real classic! and Playful Learners made a straw kazoo. OR watch the whole hangout on You Tube! Also be sure to have a look through our music page for more ideas to get your toes tapping. These are a great idea – you could have your own band! This looks kinda cool! It’s been awhile for me so this could be a restart 🙂 Thanks for sharing @ The Show Off Blog Party! If I can do it, anyone can! My first set took longer to do, but the next 2 sets went much quicker 🙂 I love that they’ve already had 2 years of enjoyment :-0 Thank you for stopping in, please come again! What a great idea!!!! 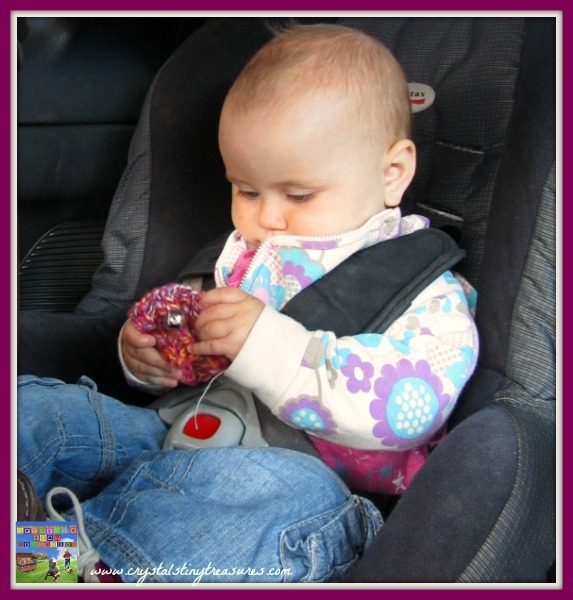 My kids always loved those little rattles that attached to the wrist but they never stayed on long. Thanks for stopping by Family Fridays!!!! They are easy to do, as I’m not a knitter and I managed 3 pairs. I like that they stretch as well which allows them to be used for a long time-my son is 5 and still enjoys them!